What will astronauts travel across the lunar surface in on their next visit? Read on to learn more about the new lunar sports utility vehicles. When astronauts visited the moon in the 1960’s their mode of travel resembled a dune buggy. It could travel across the rocky surface of the moon which allowed astronauts to collect samples. With plans to go back to the moon, NASA and Japan are working on designing new vehicles to support astronauts and their mission. Japan has asked Toyota to work on making a vehicle for use by 2029. The Japan Aerospace Exploration Agency would like to have a vehicle powered by solar cells. Why solar cells? The sun who endlessly propel the car by recharging the batteries on board. These fuel cells could power the vehicle by giving it a travel distance of 6,213 miles (10,000 kilometers). 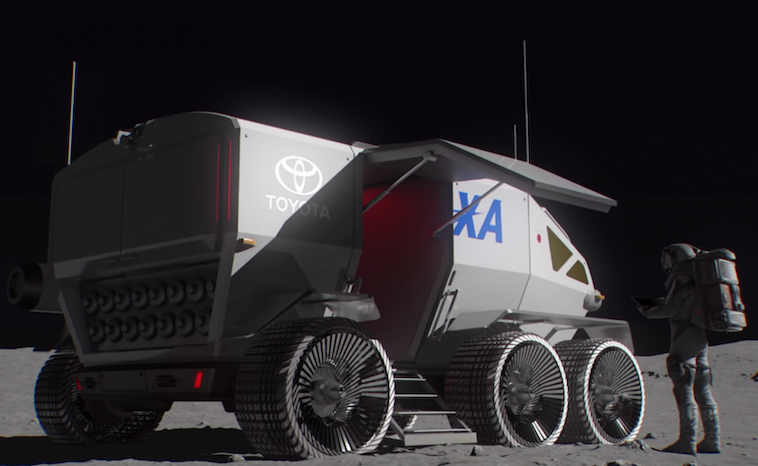 “Manned rovers with pressurized cabins are an element that will play an important role in full-fledged exploration and use of the lunar surface,” JAXA President Hiroshi Yamakawa. The lunar vehicle would accommodate two suited astronauts in a pressurized cabin. Furthermore, if an accident happened or an emergency, it could hold a total of four passengers. What would something like that look like? Japanese officials stated that they would like the vehicle to have plenty of room. It would resemble a travel camper with 140 sq.feet of living space. At twenty feet long (6 meters) it would require six all-terrain wheels. In addition, they would like it to measure 17 feet (5.2 meters) wide and 12 feet (3.8 meters) high. Basically, the astronauts would have a recreational vehicle on the moon. Safety for the astronauts remains a top priority for development. Neither Toyota or JAXA want to risk the lives of the crew aboard these vehicles. Fortunately, they have access to technology already developed by NASA to help with their final product. NASA has worked on radiation shields, windows, and panels on other probes and rovers for some years. Their ability to safely get astronauts and probes back and forth between the moon and the Earth has already been proven. NASA plans to have an orbiting lunar system in place by the early 2020s. In addition, they want to have manned lunar landings by 2026. As long as these things happen, the need for the rover will make it necessary for its development. Japanese officials will not say that Toyota will be the only manufacturer involved. However, they are currently talking to Toyota about some concept vehicles. NASA and Japan will work towards the development of this vehicle together for the good of the space program. A lunar sports utility vehicle will make exploration of the lunar surface much easier to conquer. Unlike the dune buggy concept from the 1960s, the crew can travel with their lab with them. The pressurized cabin will undoubtedly reduce their exposure to radiation from the Sun. The development of this vehicle will certainly add to our knowledge of everything related to the moon. What is the Mystery behind Black Holes?